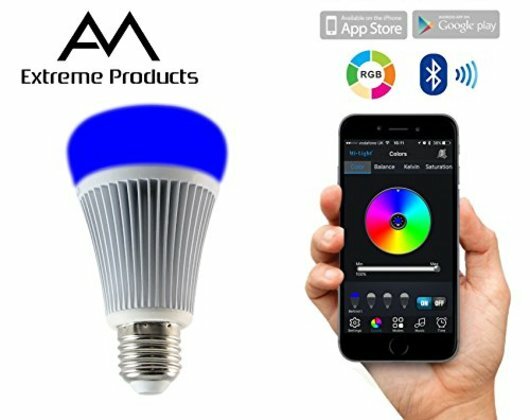 AM Extreme Products #Bestseller Bluetooth Pro-Light 8W Smart LED Light Bulb! Controlled by Smartphone or Tablet including iPhone, iPad and Android. Dimmable with over 16 Million colors to choose from! 16 MILLION COLORS - with over 16 million colors and saturations there really is one for every mood! Whether you want a bright white for concentration, a warm sunset glow to relax or a scary red for movie night it's all at your fingertips via your smartphone! MOBILE APP - Use our "MI-LIGHT" Android and IOS app to take control of the scene. Connect up to 4 bulbs via Bluetooth to control simultaneously or individually from up to 50M metres away! MUSIC RHYTHM - Play any song from the app and the lightbulbs will change color to the rhythm of the music. A real party starter! LISTEN CONTROL - Use your mobile app mic to change the color of the bulb based on atmospheric sound. That could be your voice, a movie, songs on your stereo or your noisy neighbours! TIMER MODE - Set a time for your lights to turn on and turn off. You will see a flash of the bulb to confirm the settings have been saved and you are good to go. Gives your home that little added security or a new alarm clock in the morning!